Donation tool is up and running! In the last weeks the European borders on the Mediterranean Sea have become even more invincible than before. The civil sea-rescue organizations Mission Lifeline and Sea-Watch are still being kept in port and are not allowed to continue their sea-rescue mission. These actions of the Maltese authorities are not just incomprehensible but also acute life-threatening. Even more horrible is the reaction of the German government. 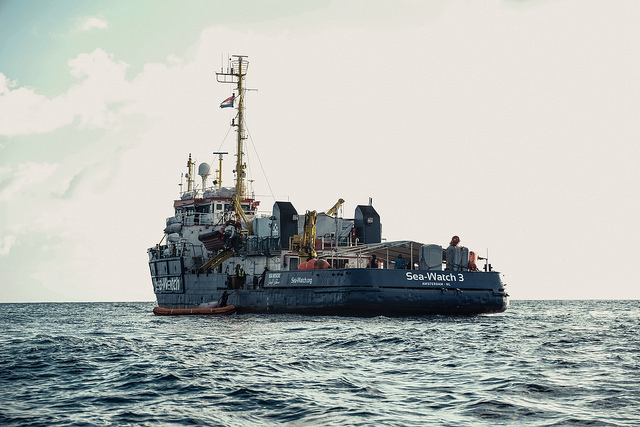 The comments of the secretary of interior Horst Seehofer are leading to a criminal-prosecution of the activists of the civil sea rescue organizations and are fueling racist and nationalist forces in their anti-immigration campaigns. We stand with the activists, who are stuck in the ports and are forced to let people drown because of inhumane politics. As you might have seen, this years Tramprennen supports the work of Sea-Watch. That’s why we feel deeply connected to their situation and send our best greetings and solidarity to Malta! Become a team sponsor here and support Sea-Watch and their civil sea-rescue mission! Thumbs up for civil sea-rescue! Sticker-Contest Ready to race to Bosnia? !